The final day of the final tournament of 2018 has just finished here in the Poker Room with three players taking home a six figure pay day. 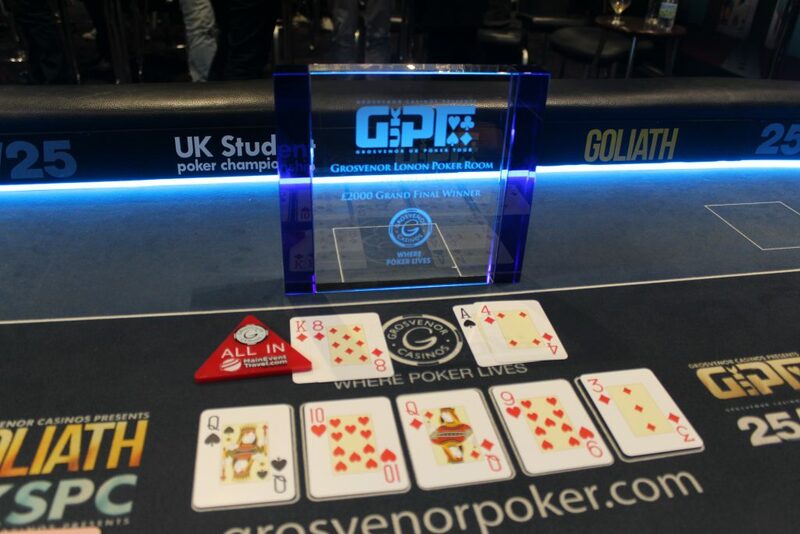 What an event this has been, the most entries and the biggest prizepool in GUKPT Grand Final history! The cardroom has been packed every single day with cash games, main event tables and side event tables. Today 20 players started the day and we have had a relatively fast 11 and a half hour day with Jerome Lhostis coming out on top and becoming the 12th GUKPT Grand Final Champion for £140,445. Thank you to everyone who joined us this year for our four days of coverage over the 9 legs and to anyone who interacted with any of our posts on Facebook or Twitter. The tour is taking some time off over the holidays now, but we will be back at the end of January, back here in The Poker Room for Leg 1 of the 2019 tour. Tamer Kamel moves all in for 800,000 and is called by Jerome Lhostis. That’s it! Jerome takes the final pot of the tournament. Tamer Kamel finishes runner up in the Grand Final for £110,000. 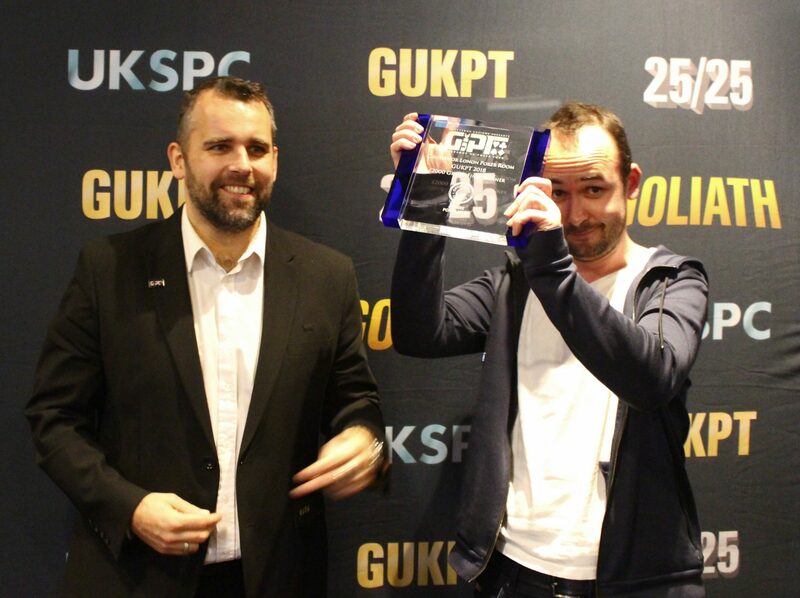 Jerome Lhostis is the GUKPt Grand Final Champion winning £140,445!! Ben Morrison is crippled by Jerome in a 5 million chip pot! The very next hand Ben gets his 500k all in holding against the of Tamer. The flop comes giving both players a pair and Ben a gut shot. The river card comes !! Straight for Tamer as he takes the pot. 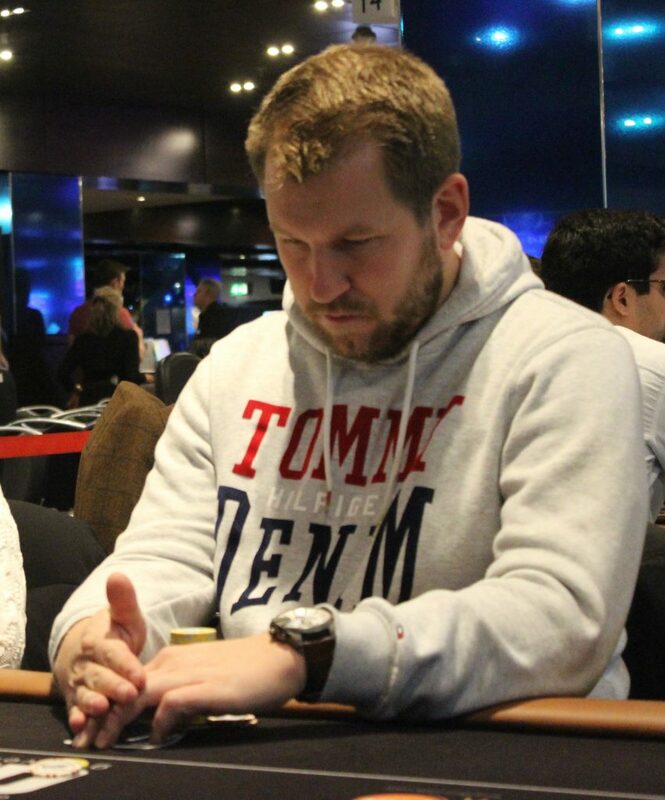 We lose Ben Morrison in 3rd place for £123,155. They have also left £20,000 to play for. 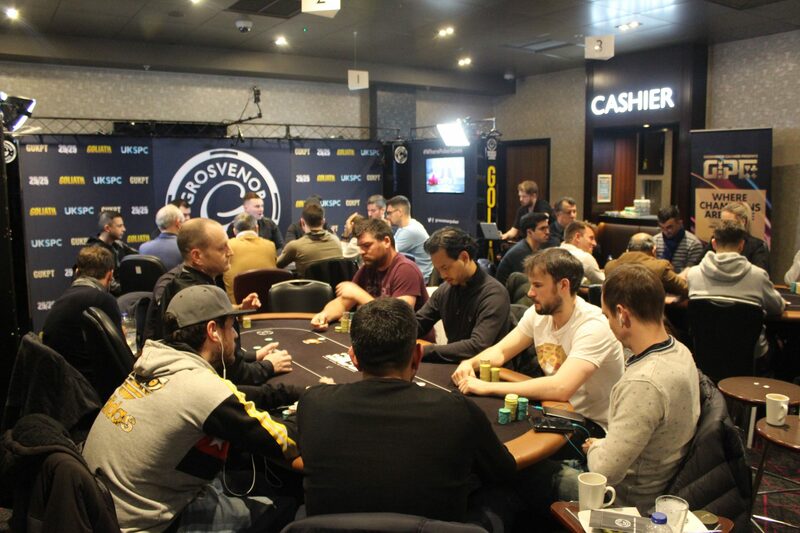 The players are back from their dinner as we begin level 28. Blinds are now 30,000/60,000 with a 5,000 ante. Break time now for the players as we take a 45 minute dinner break. Julien Sitborn shoves the button for his short stack of 5 bigs, and is called by Ben Morrison in the big blind. Julien shows and has the best hand against the of Ben. Ben finds a six on the turn to take the pot from Julien. 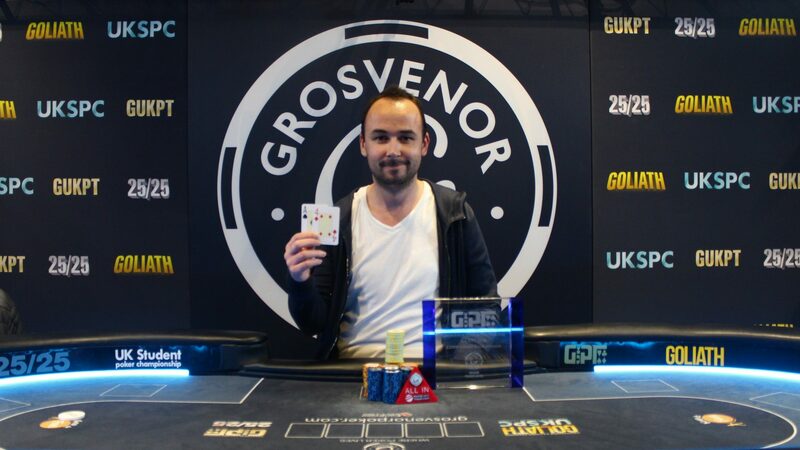 Julien finishes in 4th place for £46,800. Paul Barnes gets his 750,000 stack all in holding against the of Tamer Kamel. 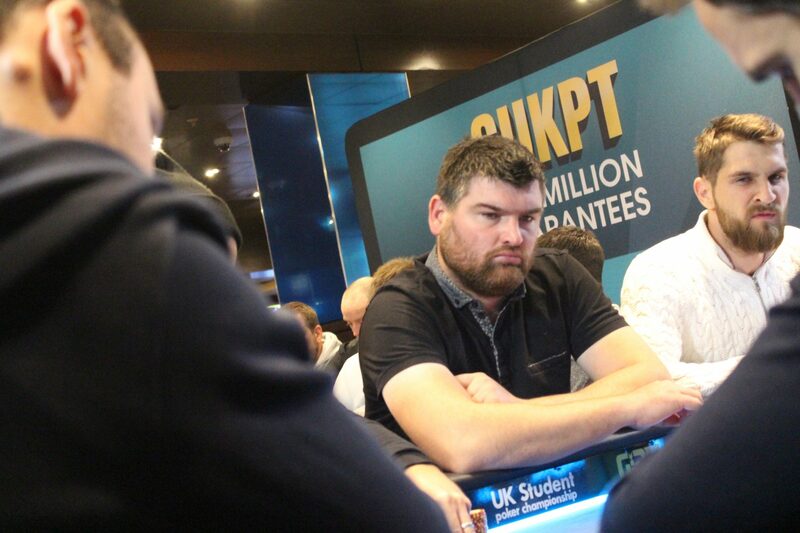 No help for Paul and he busts in 5th place for £31,800. Ludo gets his last three bigs all in with and loses to the of Julien. Very unlucky for Ludo losing the huge flip to Tamer. He leaves in 6th place for £23,400. The last hand before the break Ludo got it all in blind vs blind holding against the of Tamer. The board ran out as Ludo was counterfeited and crippled down to just 3 bigs! Tamer now has a massive 2.4million!! The food isn’t going to be ready so the players have be pulled back to play another level. Blinds are now 25,000/50,000 with a 5,000 ante. Dinner break now for the players as they take 45 minutes. 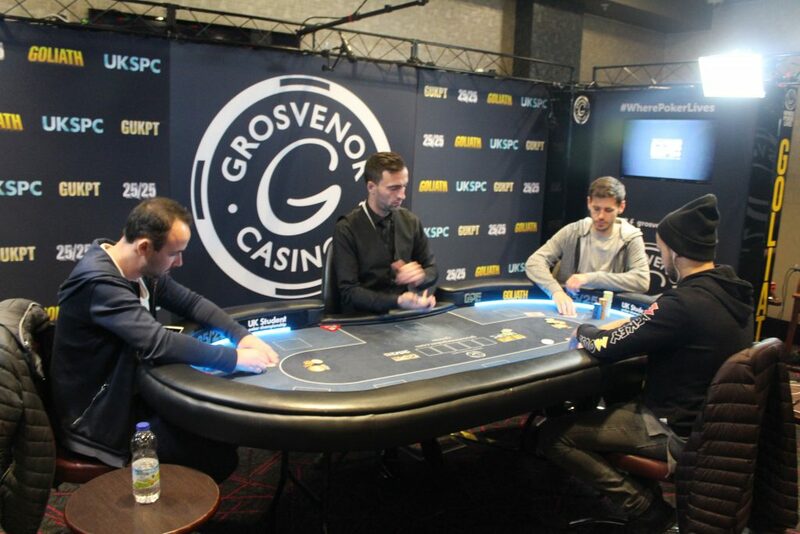 Julien Sitbon moves all in for just 250,000 and is called by Ben Morrison. Julien tables and it’s a flip against the of Ben. The flop comes as Julien flops a set! Full house for Julien as he doubles up to 550,000. Ben takes a slight hit to his stack, but he still has 3 million chips! 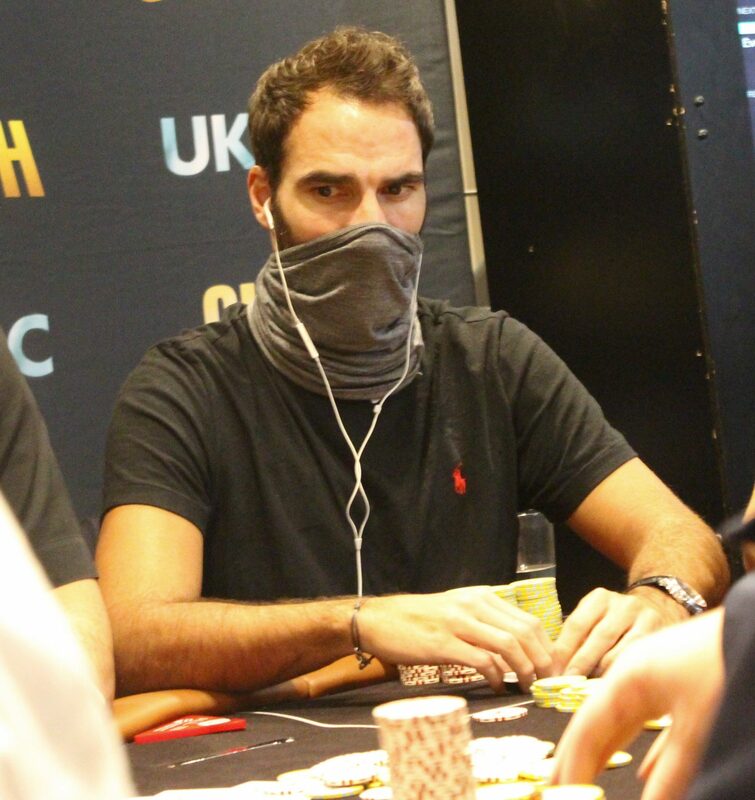 Tamer Kamel opens the button and Julien Sitbon defends the big blind. The two players go to the flop as it comes Julien check raises, Tamer shoves and Julien calls! Tamer tables for the overpair. Julien shows for the flush draw. Brick brick for Julien as he is now the short stack with 500k. Tamer gets a much needed double to 1.2million. The blinds increase as we begin level 26. They are now 20,000/40,000 with a 5,000 ante. Carlos Sanchez Diaz moves all in for his 9 bigs from under the gun, Jerome Lhostis makes the call. The rest of the players get out of the way and the cards go on their backs. Carlos tables and is up against the of Jerome. 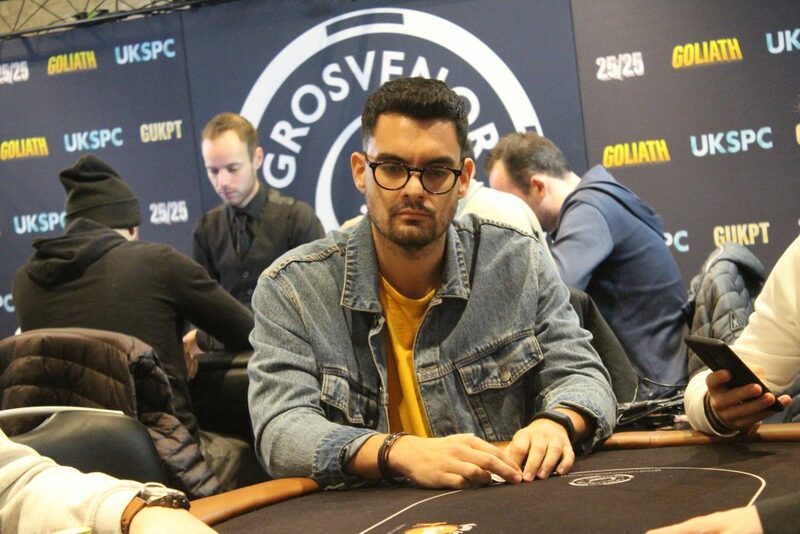 No help for Carlos as he leaves us in 7th place for £18,200. The blinds are now 15,000/30,000 with a 3,000 ante. Break time for the players as they take a 15 minute break. Jerome Lhostis opens to 50k on the button, Matas Cimbolas calls from the small blind. Ben Morrison then makes it 240,000 from the big blind. Jerome gets out the way. Matas spends 3 minutes before moving all in for 1.3million and he is snap called by Ben to create a massive 2.6million pot!! Matas tables and will need to get lucky against the of Ben. 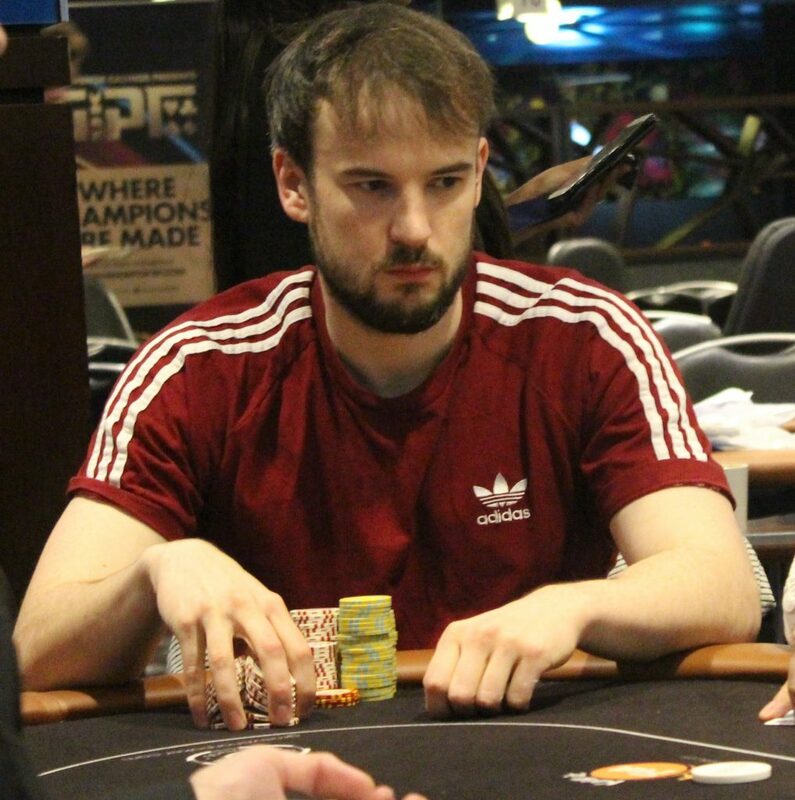 No eight on the board for Matas and we lose him in 8th place for £15,000. Ben Morrison is now HUGE chip leader with 2.7million! No real hands to speak of during the first 20 minutes of this level. The blinds increase for the first time on the final table. They are now 12,000/24,000 with a 3,000 ante. Short tack Tarjei Forus moves all in for his 280,000 and is called by Ludo. Tarjei tables but is crushed by the of Ludo. 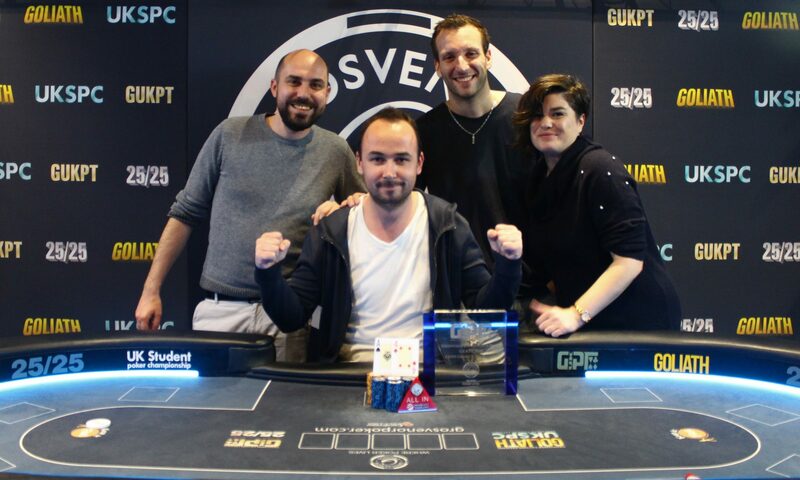 The flop comes as Tarjei flops a flush draw. Brick brick for Tarjei as he heads out of the main event for £12,000. Ludo takes the pot and now has 870,000. Blinds are starting at 10,000/20,000 with a 2,000 ante. A quick break for the players now before we begin the final table. Manuel Bardon gets his short stack all in holding and is called by Julien showing pocket eights. 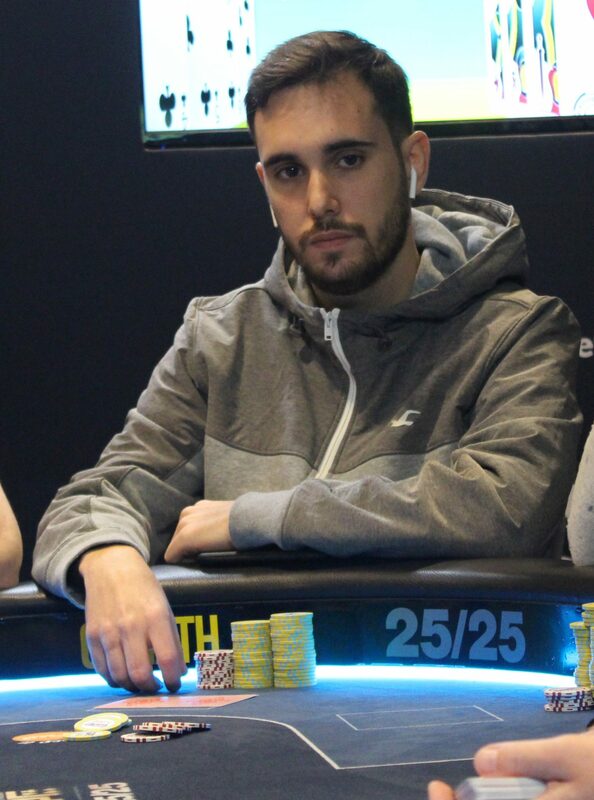 No help for Manuel and we lose him in 10th place for £10,400. It’s bang bang bang as we lose another place. The final woman in the tournament Janice Philips gets her 240,000 stack all in holding against the of Paul Barnes. Tens hold for Paul as he takes the pot. 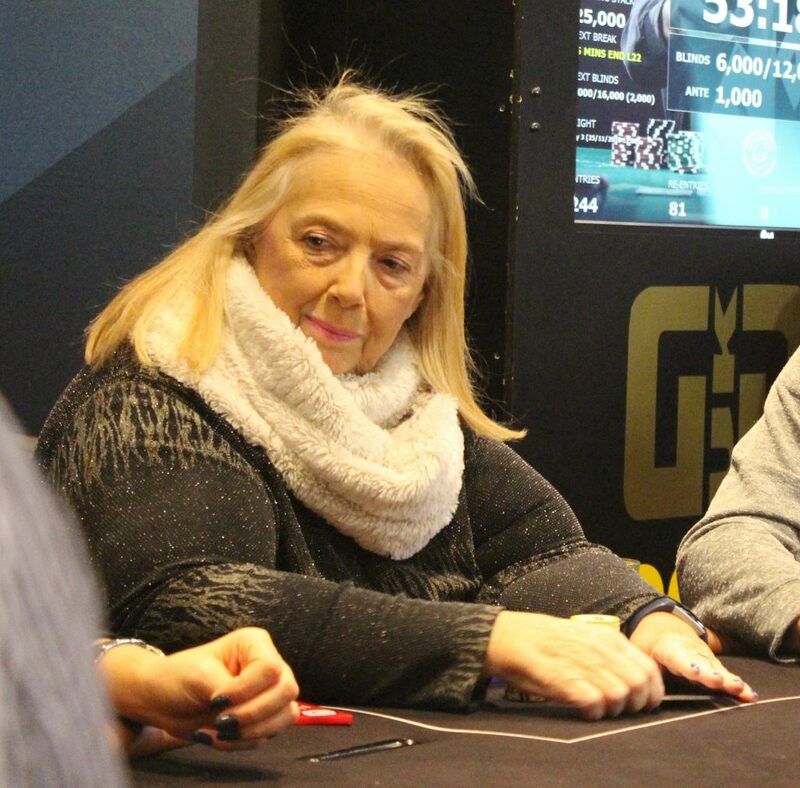 We lose Janice from the tournament in 11th place for £9,200. We are now hand for hand!! Another short stack busts as we lose Ben Jones, Jerome Lhostis also takes the last of his chips. Ben finishes in 12th place for £8,400. Tom MacDonald three bet shoves his 9 bigs and is called by Jerome Lhostis. Tom has the best hand tabling against the of Jerome. The board runs out 9 high and Jerome takes the pot, increasing his stack to over a million! 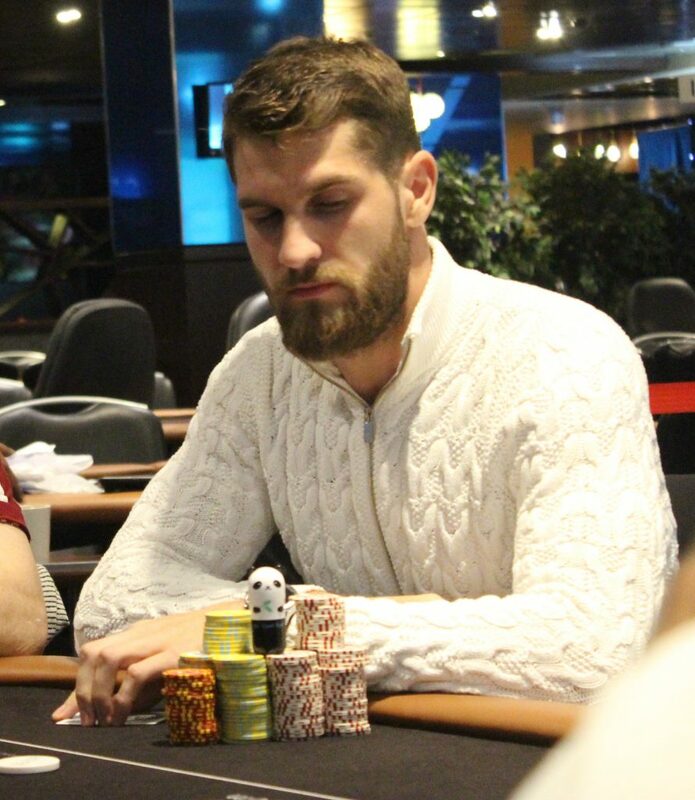 We lose Tom MacDonald from the field in 13th place for £7,700. 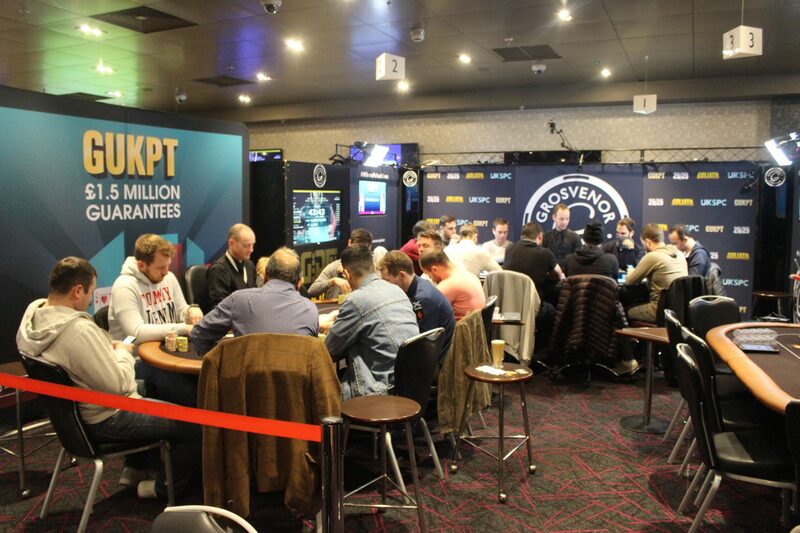 The players are back seated as we begin level 23. The blinds are 10,000/20,000 with a 2,000 ante. 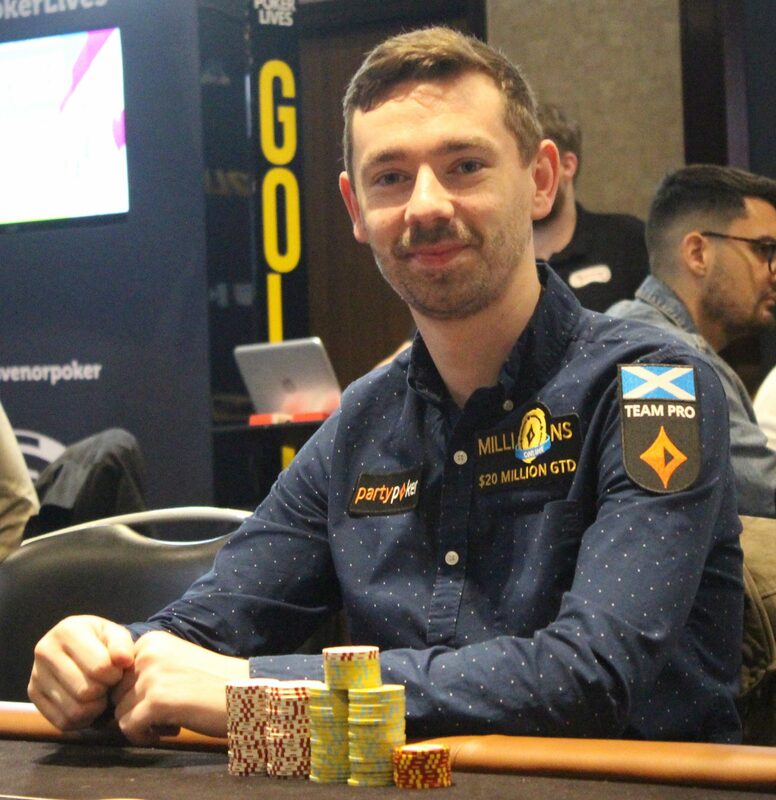 Andrew Hulme manages one double up to 200,000, but still short stacked he cannot manages a spin up and busts to Ben Morrison. He finishes in 14th place for £7,200. Derek Boyle moves all in for 300k and is called by Matas Cimbolas. Derek tables and needs big help against the of Matas. Derek doubles get it as the board runs out . Derek finishes in 16th place. 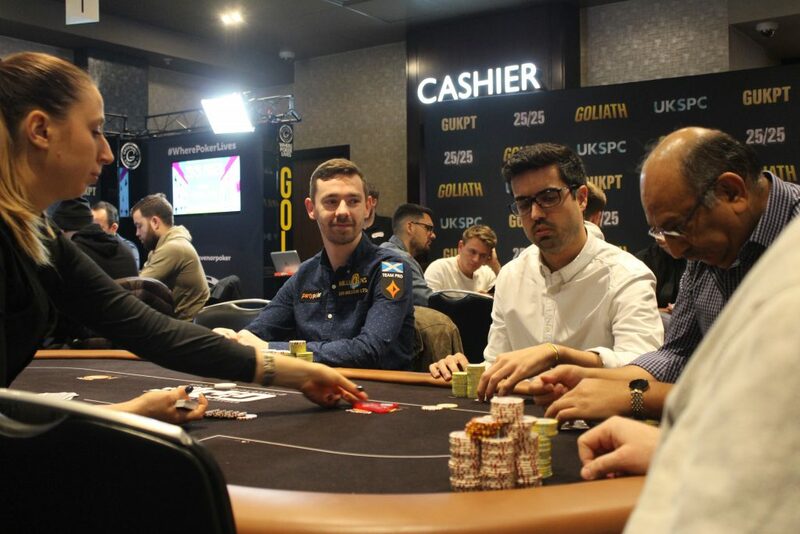 The very same hand on table number 2, Vadim Cojocaru moves all in on a flop and is called by Carlos who tables for top pair, Vadim shows for second pair. No help for Vadim on the turn and river and he busts in 15th place. There was a difference of £700 in the two finishing positions, but because the players were eliminated on the same hand they both take home £6,850 for their efforts. 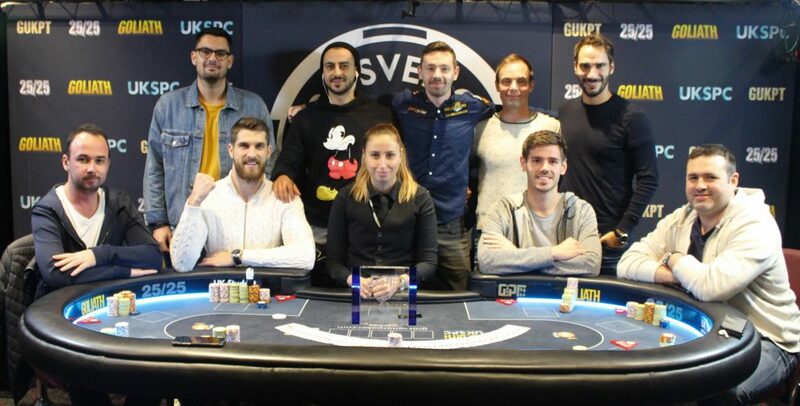 Ludo opens to 32,000, Carlos Sanchez moves all in! The action comes to Andrew Hulme, who asks for a count and is told it’s 334,000 to call. He also moves all in! The rest of the players get out of the way and the cards go on their backs..
Carlos wins the flip with two pair and doubles to over 720,000. Robert Heidorn is the next player to bust, as Ludo takes the last of his chips. Robert finishes in 17th place for £6,500. Ludo has now increased his stack to 750,000. The blinds increase as we begin the second level of the day. The blinds are now 8,000/16,000 with a 2,000 ante. 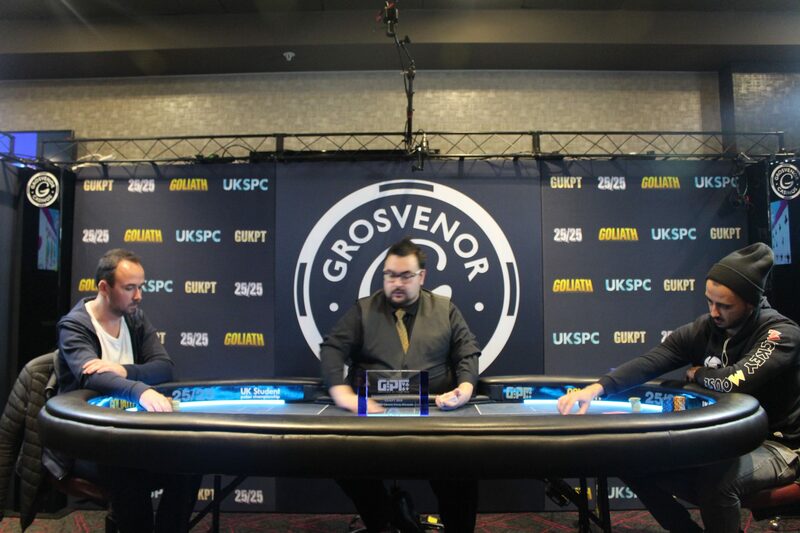 The action folds round to Alli Mallu who moves all in for his 250,000 stack and he is called by Paul Barnes in the big blind. Ali tables and is in bad shape against the of Paul. Jacks and Aces are good for Paul to take the pot. 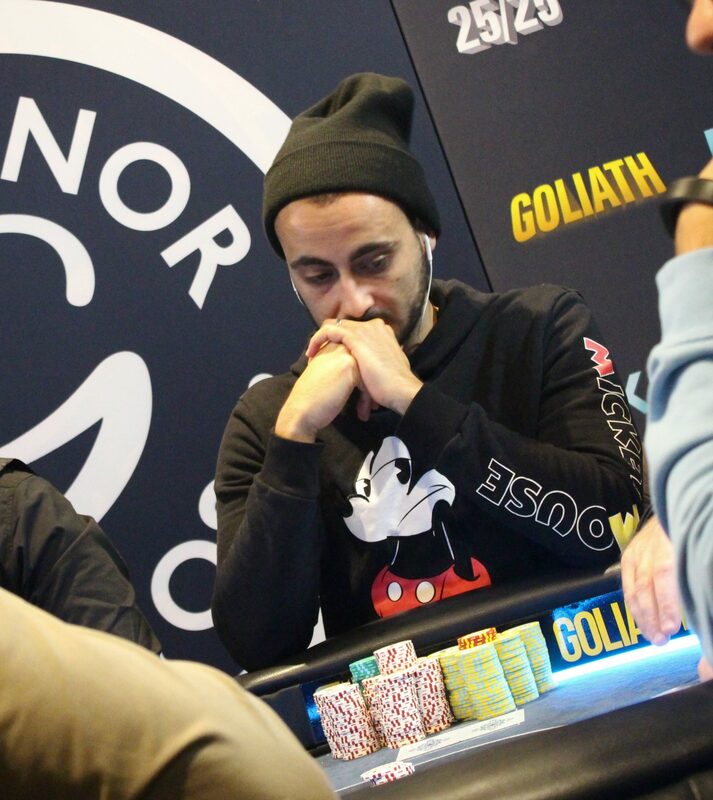 Ali exits the tournament in 18th place for £5,800. Javier Perez moves all in from the small blind and is called by Alli Mallu in the big blind. Javier is short stacks and tables he has live cards against the of Alli. Alli takes the pot as we lose Javier in 19th place for £5,800. Ben Morrison moves all in from the small blind and Yiannis calls off his 10 bigs from the big blind. The king plays as Ben takes the pot. 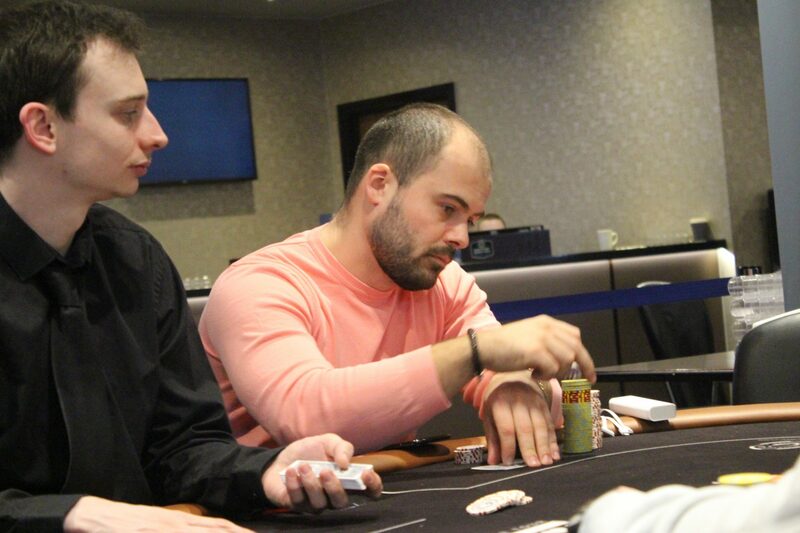 A great effort from Yiannis to make three main event final days in a row, but he finishes in 20th place for £5,800. The cards are in the air as we begin Day 3. The blinds are starting at 6,000/12,000 with 20 players remaining, playing to a winner! We should be underway in 5 minutes time.